Ketchikan, Alaska - James Bawden chose to make a living the hard way. He came to Southeast Alaska in 1882 to work as a cooper in a salmon saltery-a safe, steady, barrel-making job. But he gave it up to become a prospector and dig for gold, a dangerous, dirty and usually unprofitable undertaking. During the late 1880s he explored the territory from the tiny settlement of Ketchikan as far south as Cape Fox and the Canadian border, covering a lot of ground with a miner's pick and shovel. 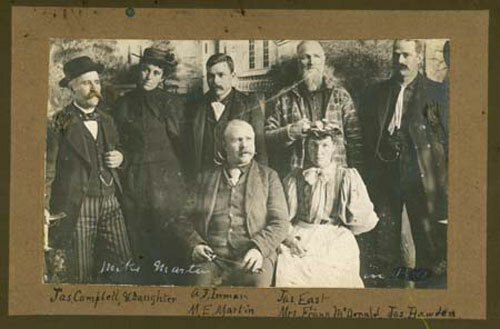 Mike Martin and company 1891. James Bawden is pictured on the far right. In the fall of 1889 he discovered gold on the east side of Annette Island. He staked several claims, returned to Ketchikan for supplies and capital and in 1892 went back to work the claims, which turned out to contain not just gold, but also silver and copper. As Bawden's work progressed, however, the federal government passed a law that reserved Annette Island for the exclusive use of the Tsimshian Indians who'd settled at Metlakatla on the west side of the island. When Bawden ignored the law and continued to work, Father William Duncan, Episcopal priest and spokesman for the Tsimshians, ordered the miners off the island. Bawden chose to ignore not just the government but Father Duncan too. He not only remained on Annette, but continued to explore the eastern shores and staked additional claims in the summer of 1894. Finally, due to a lack of money and supplies, Bawden did end up leaving the island. Not a wealthy man, Bawden had been grubstaked for years by George Clark, part owner of the Clark & Martin General Store in Ketchikan. When year after year the Annette Island claims returned low gold values, it's clear that Clark gave up on them and on Bawden's grubstake as well. In 1899 Bawden explored the hills above Twelvemile Arm on Prince of Wales Island, where he discovered a rich quartz vein that contained gold, pyrite, galena and zinc. Bawden named his discovery the Cracker Jack and to start with that's what it was: a cracker-jack bonanza! The first load of ore returned $225 per ton after expenses. This was incredible news that sent a flurry of excitement up and down the West Coast. To further develop the mine, Bawden needed financial capital-fast. He began a search for money-men with capital to invest. After several months he came to an agreement with A. Hollis White, a mining man who'd made his money on the east coast. Bawden sold White one-eighth interest in the Cracker Jack and White interested other investors who purchased six-eighths of the mine. Angry and frustrated, Bawden sued White and his associates in court and won an undivided one-eighth interest of the Cracker Jack and its equipment, mill sites and water rights. But Bawden still did not have money to develop the mine, which had been sitting idle for months. He needed money for supplies, boats, tramway equipment, other machinery, miners, carpenters and more. Operation of a mine-especially in the wilds above Twelvemile Arm and the snows of winter-was expensive and difficult at best. Soon other prospectors began flocking to the area. They made new discoveries and developed new mines such as the Constitution and the Puyallup. These mines competed for investment with the Cracker Jack, which further frustrated Bawden. This was an added insult! Bawden went ahead, built a house on the beach and made a home at Hollis. In 1901 he proposed to and married his longtime sweetheart, Alice Newhouse. With their main residence at Hollis the couple also rented "rooms" on Main Street in Ketchikan. The rooms were upstairs in the Heckman building, where Alice stayed when Bawden went prospecting. During the same year, 1901, Bawden located another deposit. This one was closer to town (if Ketchikan could be called a "town" back then) on the north side of George Inlet near Beaver Falls Creek. The deposit included one main four-foot-thick quartz vein and several smaller veins, which came to be known as the Telegraph Group. At first the veins appeared to be a new bonanza: rich in gold and silver, as well as zinc and lead. But as Bawden worked and brought out the ore, like that on the Annette Island, it turned out to be low-grade. In 1910 he sold the Telegraph to three Ketchikan men who called themselves the Londevan Mining Company. He returned to the Cracker Jack, performed assessment work, hauled in fresh supplies and equipment, re-timbered the mine workings and drove additional tunnels and drifts. Then the worst of fates befell the mine: The ore ran out. This was a miner's worst fear. For a couple of years Bawden tried to ignore it, but finally had to accept the fact that the ore had dwindled and the Cracker Jack had become a minor producer. Then more bad news: Bawden's young wife Alice fell ill and died after treatment in a Seattle hospital. Their short marriage came to an end in December of 1903. In 1904 he bought a one-half interest in an existing mine called the Goldstream located on Gravina Island just opposite the south end of Pennock Island. His partner now was Otto Miller, a prospector he'd worked with in years past. Both Bawden and Miller thought optimistically. They assessed the Goldstream and-even though the mine's previous owners had given up on it-believed gold existed if only they could locate it. They hired a crew, extended the principal shaft and performed additional exploring and drilling. Bawden and Miller were able to ship 40 tons of sacked concentrates to the Tyee Copper Smelter in Ladysmith, B.C. Although Bawden optimistically believed the ore would run $60 per ton-and said so to a newspaper reporter-it returned only $4 per ton in free gold. Bawden returned to his old standby, the Cracker Jack. In 1914 he managed to interest foreign investors in further development of the property. This raised his hopes, especially when the investors decided to perform "a preliminary sampling program." But with the outbreak of World War I the investors shut down the operation, finding more important uses for their money. By 1916, with the war still raging and mining in a depression, Bawden had had enough. He gave up on Southeast Alaska, retired and bought a farm in Edmonds, Washington, where he planned to spend the rest of his life. But gold ran in his blood. In May of 1926 he returned to Hollis, accompanied by a mining engineer. After an inspection and survey of the Cracker Jack, always the optimist, Bawden told a newspaper reporter that new development could take place soon. But in December of that year, 1926, Bawden died. Although he made a living the hard way, he spent his life doing what he loved-exploring the hills, digging for gold and developing mines in the Ketchikan Mining District. Ketchikan honored him by naming a downtown street for him: Bawden Street. Bufvers, John. History of Mines and Prospects, Ketchikan District, Prior to 1952, State of Alaska, Department of Natural Resources, Juneau, AK: 1967. Ketchikan Alaska Chronicle, Ketchikan, AK: May 27, 1926. Roppel, Patricia. Land of Mists, Farwest Research, Wrangell, AK: 1998. Roppel, Patricia. Striking It Rich! Farwest Research, Wrangell, AK: 2005. The Ketchikan Mining Journal, Ketchikan, Alaska: December 12, 1903. The Ketchikan Mining Journal, Ketchikan, Alaska: August 6, 1904.